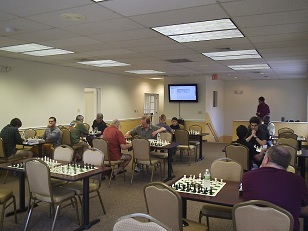 Saturday was a good day for chess as 18 players participated in our Spring Quads. The top section was a master quad in which NM Oliver Chernin joined FM Nelson Castaneda, NM Ian Harris and NM Daniel Lowinger. Lowinger was looking for a repeat performance of the previous night and Castaneda was looking to rebound, but it was Harris’s turn to shine as he defeated both of them and then finished off the tournament with a wild draw against Chernin! Quad two was also quite strong with strong expert Andres Castaneda leading the pack from start to finish and only ceding one draw to Nicolas Checa. Checa also had a solid result drawing all three of his games against tough opposition. Next was a very close-knit six player swiss with four 1700’s, a 1600 and a 1400. CCFC Director Melvin Patrick looked to pick up where he left off, but fell in the first two rounds to Leo Bykhovsky and Jonathan Aiyathurai. Bykhovsky lost to Herring who was defeated by Aiyathurai, which gave Aiyathurai the win and catapulted him over 1800! Quad three was a very dangerous section. The favorite on paper was Vincent Xu, but he was chased very closely by Grant Wang and Ellen Rosenfeld. Add to that, a relatively unknown 600 rated player who arrived in a group of experts and masters, and you have an incredibly unpredictable section. In the end, it was Xu who managed to maintain his hold on the top position by only drawing one game! Ellen Rosenfeld finished closely behind with 2 points. Congratulations to all of this week’s winners and we look forward to seeing everyone again soon!